I have codes for all injectors open or short to ground. Also temp sensor data incorrect. And internal voltage code. I have installed new batteries cleaned all grounds did voltage drops and have proper voltage everywhere I think it should. Bus runs and drives fine besides these codes. Any ideas? You say you have codes for all injectors. Which codes would they be? Inquiring minds would like to know. Do you know how to drop codes on this, and if so, plz post them here. The variants for internationals are quite vast. I understand this is a bus. School bus in fact as most VT365's are school buses or similar. Since you said open or short to ground, that should mean you have a specific code such as a injector drive circuit, but which one is it? Here is a pdf to a service manual. 120 pages of great info on that VT365. Have at it. Anything Inter related is like linux, free of charge. Find me that 3 digit code first before going bonzai on this simple truck. Page 25 and 41 of the pdf will bring you to the IDM. Injection driver module. On these chapters of engine management you should find all related diagnostics and wiring. Most often, the IDM module goes south. If you need more info ask. I only ask what codes you got?? I also think idm, but the temp sensor code is also power related. But it could be a preexisting code from before. They took this to an activity and on the way back it threw the light. But made it home. I can clear them and they don't come back till I start it and then almost instantly all codes come back. Well then, I must say first of all, thx for the pic of an actual laptop actually hooked up. We don't get to see that often from our posters here. I am approaching this as I would a gas injection flow chart would go, we are seeing that more and more now on diesels today. I would not see all injectors shorting or going open at the same time, which again confirms my suspicion that it is the IDM module since you state you have checked the injector grounds in post #1. 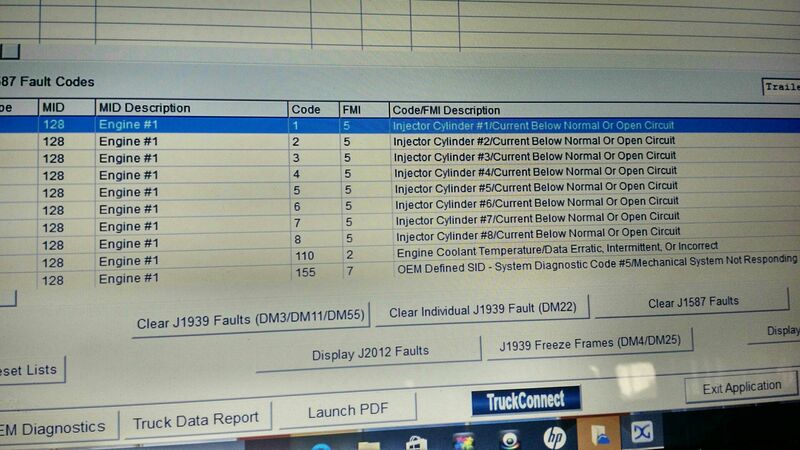 I see that your scan tool software indicates FMI for all injectors @ #5 which indicates open circuit, and not grounded. 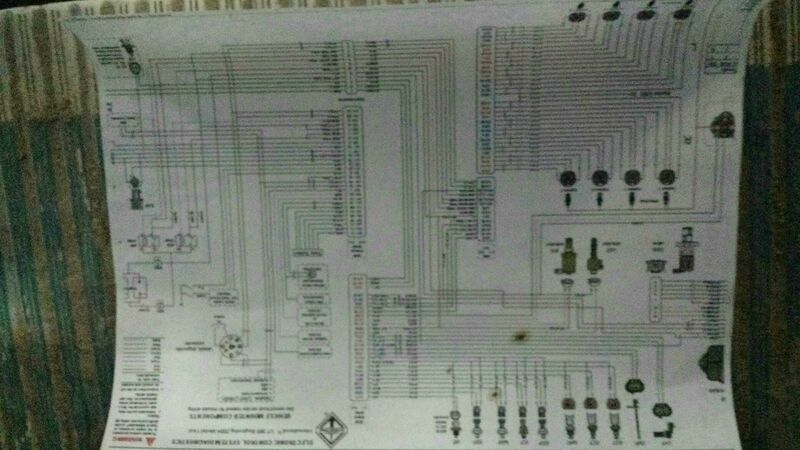 So I tried to find some proper wirings for you and I found this so you can pin test the injector circuits to the IDM before condemning it. I also provided some pin out test values. They are for a 466, but maybe they can help provide some ECM to IDM correlation to find why your 8 injectors are showing an open circuit. Like I said, I realize the wiring and pin out is for a 6cyl. I hope they will help. I have the circuit wiring picture as well. I should have indicated that so you didn't waste your time looking for it. I notice you help on a lot of other posts as well and I thank you for taking your time to pick your brain with me. I just hate to throw in an idm and that's not it. But I have wasted a lot of time looking for a bad wire as well. I replaced all the connectors as stated in the international recall as well the "clean" power connectors between the battery and ecu and idm and trans computer. I run a bus fleet with 30 VT 365's of this vintage. From your description and diagnosis so far I would say your IDM is failing. You can now buy just the lower half preprogrammed from IH. The only other thing I would check is all your pinns for corrosion or bent at the IDM.